Recently my family and I went through photos we had taken in Scotland. These images brought back memories of my fascination with the pristine Scottish natural environment. There are the breathtaking highlands, the sparkling lochs, the magnificent glens and the abundant wildlife. All these reminded me of Liaoning, my home province. I spent my childhood in Liaoning in northeast China. It resembles Scotland in many ways. It is a vast landscape with spectacular mountains and rivers. Equally well-known is its abundant wildlife. Roe deer and hares are a common sight. Unfortunately, in recent years some wild animals have become a rarity, in some areas, due to overdevelopment and depletion of natural resources. However, when I was on home leave back in Liaoning not long ago I was delighted, and greatly encouraged, by the vigorous efforts of local government and people to create a sustainable environment. Hundreds of thousands of hectares of farmland have been returned to forests, and over 10,000 kilometers of barren mountains have become restricted areas to encourage reforestation. All these actions are raising hope for improvement in the ecosystem. In the neighboring Jilin province, thanks to a decade-long hunting ban, populations of hare, roe deer, boar and other wildlife have all risen significantly. In other parts of China there are reports about the revival of glossy ibis, loris and sika deer as well as other endangered species. These are welcome indications of a positive turnaround of wildlife in China. Underlying such good news are the strenuous efforts made by the Chinese government in creating a sustainable environment or "green" China. In recent years, China has placed greater emphasis on wildlife protection and enforced stricter measures. We have put in place a full range of rules and regulations with the Law of the People's Republic of China on Protection of Wildlife and related forestry laws as the centerpieces. China has set up special agencies for wildlife rescue, breeding and release. These include breeding bases, zoos and wildlife reserves of which the panda center near Chengdu has become world-famous. Money-wise, China has invested more than 400 billion RMB to preserve natural forests and develop reforestation. These resources have played a big role in restoring and expanding the habitat of wildlife. On top of this, China has successfully maintained stable populations of 230 endangered species through artificial breeding. Internationally, China has joined the Convention on International Trade in Endangered Species of Wild Fauna and Flora and signed inter-governmental agreements on wildlife conservation with a number of countries. With this multi-pronged approach at work, populations of endangered species in China have stopped declining and started to recover. For example, only seven crested ibis were known to exist in 1981. Today the number has grown to over 1,700. There were about 300 Chinese alligators in the 1980s. Now the number has exceeded 10,000. Przewalski's horses and Pere David's deer previously believed to be extinct have now reestablished their populations in the wild. Apart from the government, more and more social forces have joined the cause. NGOs such as China Wildlife Conservation Association, celebrities, businesses, volunteers and the media have all come on board either through campaigning or through donations. 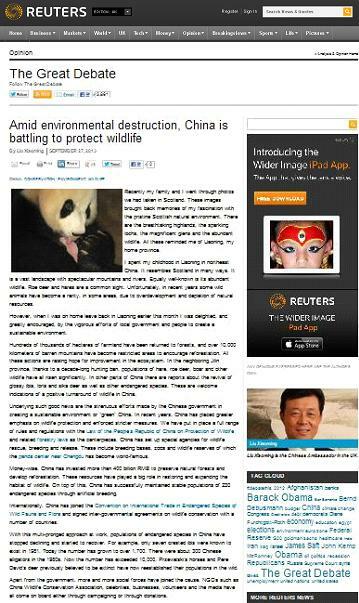 In China today, any report about environmental destruction and animal abuse on the Internet will arouse indignation and invite harsh criticism from the public. The notion that: "when the buying stops, the killing can too" has gradually become a deeply-held social consensus. The massive support from the public has laid a solid foundation for wildlife conservation in China. In spite of the progress, we are aware that China still has a long way to go. Some wildlife species remain on the verge of extinction. Killing, poaching, smuggling and illegal trade in wildlife products are reported from time to time. Each and every such case, wherever and however it may happen, is a severe warning for us. It cautions us that grave challenges lie ahead in protecting wildlife and unwavering efforts are necessary. What is encouraging is that China has taken very firm steps, and will continue to do so in the future.